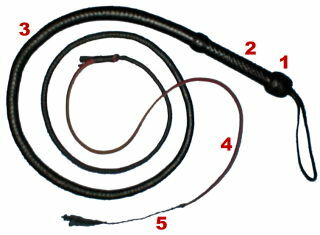 Whips can be made of a large variety of materials. most common is leather, from animals like cows, horses, goats or even hippos. 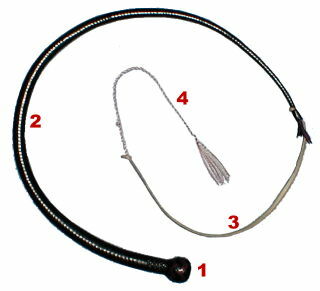 The best whips are made of kangaroo hide, which is very dense and durable, but also very thin, thus allowing finest braiding work. Besides natural materials, there are also whips made of Nylon®, Dyneema®, Spectra® and other artificial fibres, these developed since the 1960s and are becoming very popular now. Basically, a whip consists of a braided, tapered thong, which ends in a fine point, the so-called cracker. This cracker breaks the sound barrier when the whip is swung, producing the typical sound of the whip, actually a miniature sonic boom. This is a short overview of the main whip types with construction details and informations about their purposes. 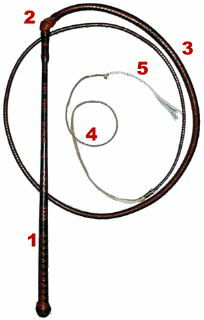 Most common is the bullwhip, well known from movies like "Indiana Jones", "Zorro", "Batman", and many more. 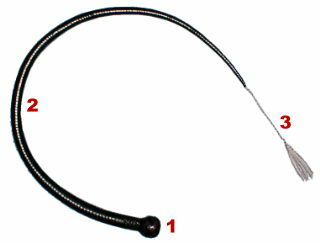 It has a short, rigid handle (2) with a big knob (1), followed by a tapered, braided thong (3). To this thong the fall (4) is connected, a tapered strip of leather, with the Cracker (5) on top. The bullwhip was originally used for herding, today it is mainly a sports cracking whip, especially in the USA and Europe. In sports whipcracking, also the Australian stockwhip plays an essential role. It is very fast, therefore suitable for quick sequences of cracks. In Australia there are whipcracking championships with the stockwhip as preferred instrument. The sometimes flexible stock (1) has a keeper (2), holding the braided thong (3) with fall (4) and cracker (5). The blacksnake is a bullwhip minus the handle. The thong (2) is flexible up to the knob (1), the whip can be rolled up easily and stored in a saddle bag. This was appreciated by the American cowboys, who didn´t like to use whips with long, rigid parts on horseback. Like the foregoing whips, the blacksnake is equipped with fall (3) and cracker (4). Originally, the signal whip was developed for dog sled races. There was need for a whip allowing to give signals to the dogs without the possibility of hitting them. Due to its small size it can be easily used indoors. It is very precise, making it an ideal whip for targeting. The construction is a bit similar to the blacksnake´s: the knob (1), the fully flexible thong (2) and the cracker, directly attached. There is no fall. The cracker is braided into the last few inches of the thong, therefore hard to replace. Good to know it lasts a long time if the whip is used carefully. Now there are new developments, where the cracker is connected to a tiny keeper at the point of the thong. This allows easy change and makes a whip nearly as accurate as the classic form. Measurements: whips are measured in feet (ft) with 1 ft = 30,4 cm. The method depends on the whip type: bullwhips, blacksnakes and signal whips are measured from the knob to the end of the braided thong. That means whole length minus cracker, fall and wrist loop. On stockwhips, only the braided thong counts to the length. Therefore, a 6 ft stockwhip has an additional length of about 1.5ft compared to a 6ft bullwhip! Plaits: the number of braided strands in a whip´s thong is called plaits (plt). Simple whips are 4plt, but there are masterpieces of whip making art with up to 72 plt! Generally, the more strands a whip has, the more accurate it will be, but this is only valid up to 12plt, a bit more on short whips. The price will be a higher risk of damage due to the delicate structure. On working whips, 8-12plt are recommended. Short whips may be more fluid at 12-16plt. There are high-end kangaroo hide stockwhips available which are just 4plt and behave like their high-plait cousins.